Guadalupe’s loss is Orcutt’s gain with the opening last week of the new Far Western Tavern in the 300 block of West Clark Avenue. The long-time family owned and managed steakhouse closed the doors at its original location on Highway 1 in Guadalupe Oct. 7, and opened for business a little more than two weeks later at 300 W. Clark, in Old Town Orcutt. 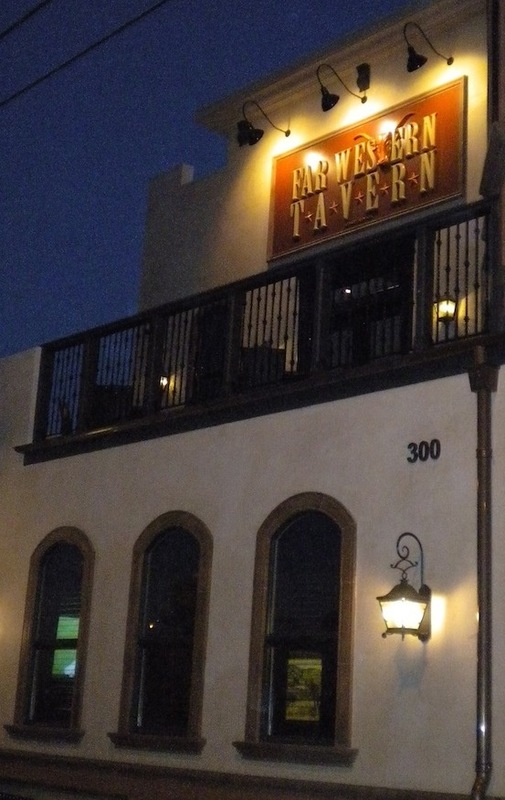 The newly opened Far Western Tavern on Clark Avenue in Old Town Orcutt. The historic, western side of Orcutt has enjoyed a surge in new eateries with the addition in recent years of Rooney’s Irish Pub, Trattoria Uliveto and a new coffee house alongside old favorites Orcutt Brew (formerly the Loading Dock), Jack’s Restaurant and Kay’s Country Kitchen. The Orcutt version of the Far Western stands in a brand new building at the corner of Pacific Street and Clark Avenue, but the interior sports the similar wood-beam and dark ambience as its Guadalupe predecessor. Rick Manson (“Chef Rick”) is the chef for the new site, and has brought many of the house specialities from his former Orcutt restaurant, Chef Rick’s, to the menu at the Far Western.